Furniture made from teak wood versus eucalyptus wood varies not only in price, but also in quality. While both teak and eucalyptus are tropical hardwoods that weather to a silver patina with age when left outside, teak is a longer-lasting, more durable and -- not surprisingly -- more expensive wood. Since eucalyptus wood furniture provides a similar look without the high price tag, it's an affordable option for budget-conscious consumers. Before making a final decision on which wood furniture works best for you, look past the price tag and consider what each wood has to offer. 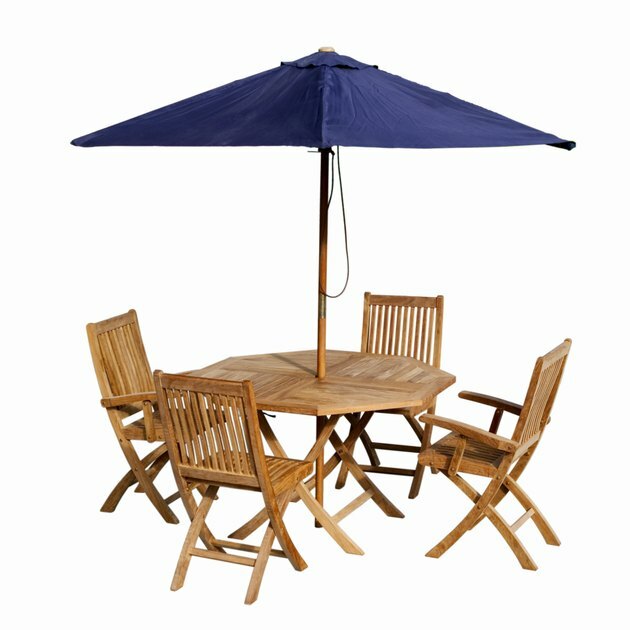 Wooden patio furniture is as only durable as the wood. Teak and eucalyptus are both strong and long-lasting, but woodworkers and carpenters consider teak as king when comparing the two. The high mineral content in teak wood prevents it from warping, and its natural oils prevent it from rotting and cracking in even the wettest conditions. Because of its hardiness, furniture made of teak holds up well enough to be passed down to the next generation. Although similar in color and density and having the same straight, tight grain as teak, furniture made of eucalyptus wood is slightly less durable. The natural oils in eucalyptus wood contain insect-, water-, and moisture-repelling properties, which help to protect it from rot and decay, but it will not prevent it completely. Expect to replace eucalyptus furniture to last 25 years on average. Teak wood furniture requires almost no maintenance aside from the occasional cleaning to remove surface dirt. Scrub teak furniture with water and a plastic bristle brush in the direction of the grain, and then rinse with water to remove stuck-on dirt. Sand furniture made with eucalyptus lightly once a year to remove any fuzziness that occurs to it because of exposure to the elements. Do not sand through the weathered silver look of the wood to expose the natural color, but only lightly to smooth out unevenness and splintered wood. Add wood oil designed for teak or eucalyptus by applying it with a soft cloth to furniture once a year to help maintain the wood's health and prolong the life of the furniture. Because of its high durability, long lifespan and low maintenance, teak furniture is one of the most expensive and highly sought-after options for outdoor furniture. Teak is native to India, but is grown on teak plantations due to its scarcity. Eucalyptus furniture is less expensive than teak, making it an affordable option for buyers who love the look of teak at one-third its cost. Additionally, the exceptionally fast growth of the eucalyptus tree makes it a sustainable resource and a favorite choice for eco-conscious consumers. In addition to growing naturally, both teak and eucalyptus trees are grown on plantations to help meet consumer demand while preventing deforestation. The Forest Stewardship Council sets the standards for responsible forestry and protects forests of all kinds for future generations. Teak or eucalyptus furniture marked with the FSC seal ensures the consumer that the plantation met specific requirements to help maintain or restore the ecosystem. Whether buying teak or eucalyptus furniture, look for this seal.